The M1 Abrams eclipsed for the last thirty years all past MBTs to date, including the M48/M60 series. It represented a definitive change in US tank design since World War 2 and was engineered with the crew protection in mind, but without sacrificing either the firepower or mobility. Since numerous reports from the 1973 Yom Kippur war were carefully dissected, this was expressed inside NATO as the “air-land battle” concept in 1976, formulated in 1982 as the AirLand Battle Doctrine, which emphasised adequate combinations of land and air power to deal with a considerable fleet of soviet tanks with increased lethality. The future tank was to be capable of tactical superiority on the battlefield in order to compensate for the numerical inferiority. The approach taken by the Army staff was not to build the best tank overall, but to reach any objectives within the lowest budget possible. Since any MBT is a compromise, the process was not simple, and the Army chose to play for a competitive process, each company trying the best possible tank design for a development at the lowest cost. The two companies chosen were without surprise, Chrysler Corporation (builder of the M60) and the General Motors Corporation (builder of the MBT-70). Eventually, the M1 proved its excellence in combat, during the first Persian gulf war (1991), and the post nine-eleven operations in Afghanistan and Irak. In all these operations, the M1 reigned supreme and washed over any armored opposition with apparent ease, earning a solid reputation as one of the world’s very best MBTs. The MBT-70 as built, in full speed trials at Aberdeen proving grounds in 1968. The MBT 70 (For “Main Battle Tank, 1970) was an attempt to devise a joint US-German project for a new battle tank. US Army already evaluated the Leopard when in Germany in the 1960s and it was clear that both countries learned a great deal about the evolution of tactical warfare and ideas revolving on new concepts based on armored mobility, with new standards both in protection and firepower. At that time, both the M48 and M60, derived from the postwar M47 proceeded from the same 1st generation basic design, with classical RHA protection, and the upgrade of the British L7 105 mm “sniper gun”. When the existence of the T-62 and its 120 mm smoothbore gun were known, the need for a new MBT generation was even accentuated. At that time theories about AT missiles which could be fired by a tank, like the Shillelagh program tested on the M60A2 and Sheridan, were largely in favour, but proved later ill-fated in practice and abandoned in the 1980s. The whole program began in 1965 or so, with a memorandum of understanding. The program however soon encountered multiple difficulties over different armies requirements over the engine, gun, armour features, and overall the use of either the SAE or metric system for measurements. These were settled by using both, and considering all options at once in a same package, raising costs at a staggering levels. However the concept concentrated many new technologies, unheard of for the time. The height-adjustable pneumatic suspension which allowed the tank to elevate or depress the gun like never before, and at the same time, allowed for far greater speeds in a smooth ride. The small body saw the driver always facing the direction of travel. The main gun (for US service) was a 152 mm tailored to fire the MGM-51 Shillelagh missile and conventional rounds. But the whole program proved to be too heavy, complex, and moreover expensive. Fearing the cancellation, the U.S. Army introduced the XM803 as a “backup” solution, sharing some technologies but removing the more costly and troublesome ones. but doing so, this produced a still expensive system with capabilities which were not advanced compared to the M60. Germany on the other hands, was not satisfied either, pulling more and more the project in another direction. The first prototypes construction started in 1965, with 7 hulls of both the US and German versions, for a total of 14. Others tests were performed from 1966 to 1968 with the full trials. Problems occurred with the centerline cupola, XM-150 gun/launcher autoloader, 20 mm AA gun, turbine engine, and overall weight (near 60 short tons at the end of the development). The XM803 in trials, 1970. This was the ancestor of the XM815, then XM-1 standardized as the M1_Abrams. Credits:wikipedia. Soon, the original MBT 70 program estimated $80 million (292.8 million DM) plan was shattered, as in 1969 the project cost was $303 million (1.1 billion DM). The Bundestag stopped all further developments and the Bundeswehr used what was already gained to built the Keiler (Future Leopard II). The US. Congress eventually canceled the MBT-70 in November, followed by the alternative XM803 in December 1971. The funds were reallocated to the XM815, renamed later XM1 Abrams. This new program reused most of the XM803 features but again, in a simpler and cheaper way. The need to eliminates the costliest technologies from the failed MBT-70 project, defined those used in the new tank. The name of the new tank was a departure from the postwar tradition, chosen to honor General Creighton Abrams, considered as an equal or even a better tank commander by Patton himself. A veteran of the Korean and Vietnam war, Abrams was promoted Chief of Staff of the United States Army in June 1972 before passing away in 1974. In June 1973, The Chrysler Corporation and the Detroit Diesel Allison Division of the General Motors Corporation were awarded the contract to built prototypes of the new tank designated M1, handed over to the US Army for trials in February 1976. The first prototypes were armed with the license-built 105 mm L/52 M68 rifled gun (L7), and both were compared in field tests between themselves and to the Leopard 2. Chrysler Defense actively promoted a turbine-engine model and was selected for the development of the M1. Chrysler’s experience with so-propelled land vehicles was going back indeed to the 1950s. After 1982, General Dynamics Land Systems Division purchased Chrysler Defense. Initial production was set up at the Lima Army Modification Center at Lima in 1979, and the first production vehicles rolled out the factory in 1980. The first production was preceded by eleven Full-Scale Engineering Development (FSED) XM-1 testbed vehicles produced in 1977-78, also called Pilot Vehicles (PV-1 to PV-11). The first batch of M1s, before standardization, were still designated XM-1s, as Low Rate Initial Production (LRIP) models. 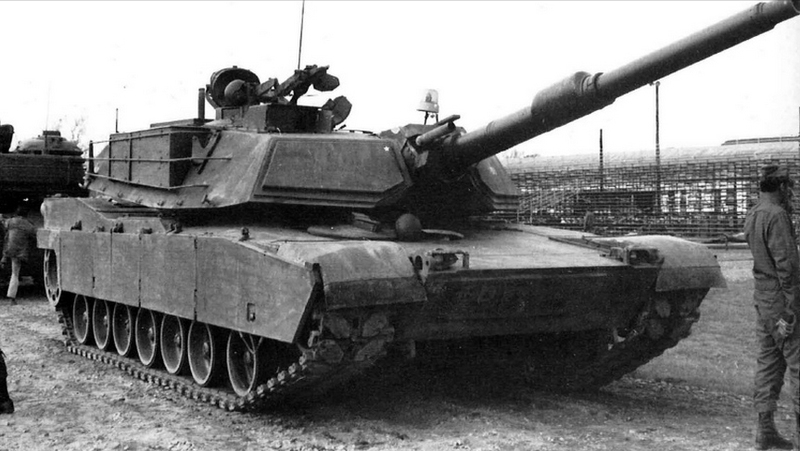 The XM1 Abrams prototype in trials, 1976. it was standardized later as the M1 Abrams. Credits: General Dynamics. The hull is made of solid RHA, a single block made of massive parts welded together (bottom, front beak, glacis plate, sides, rear plate), with compartmentation. The driver is located in the front center, at the feet of the turret ring, with three periscopes (see later) and a one-piece hatch which can be opened at any time in regards to the turret. The particular hull front is composed of a beak sloped downwards, which joined an almost vertical glacis plate up to the turret. The hull armor is made of RHA but the turret was made of a composite armor. There is a characteristic rear hull elevation to house the turbine engine. The sides are flat, but tooling storage is assumed by the turret’s sides and rear baskets and bins. Crew protection inside the tank comprised the halon automatic fire extinguisher system. In addition, smaller hand-held fire extinguishers are also provided. The engine compartment’s one is engaged by pulling a T-handle located on the left side of the tank. Fuel and ammunition are safely stored in armored compartments with blowout panels to prevent the ammo from “cooking off” if damaged, and the main gun’s ammunition is stored in the turret rear with blast doors which opens and slides automatically when ejecting a spent round. The tank is fully NBC-proven with a special lining, a 200 SCFM clean conditioned air system, a Radiac Radiological Warning Device AN/VDR-1 and a chemical agent detector, in addition to the crew’s protective suits and face masks. 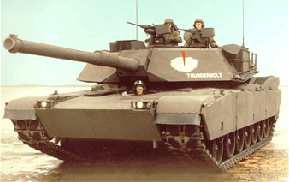 XM1 Abrams “Thunderbolt” of the first series in 1978. Credits: General Dynamics. The big heart of the Abrams, siege of unparalleled performances, is the Lycoming AGT 1500 multi-fuel gas turbine (later manufactured by Honeywell) capable of delivering 1,500 shaft horsepower (1,100 kW). It was served by a six-speed (four forward, two reverse) Allison X-1100-3B Hydro-Kinetic automatic transmission. Top speed was 45 mph (72 km/h) on paved roads, and 30 mph (48 km/h) cross-country with a governor, but up to 60 mph (97 km/h) on road with the engine governor removed, which was way ahead of the M60 and M48, and equalled the Christie “race tank” performances back in 1930. However in operations, to prevent any damage to the drivetrain and shock injuries for the crew, a cruising speed of just above 45 mph (72 km/h) was maintained. The engine is multifuel according to NATO’s standards, accepting diesel, kerosene, motor gasoline and even high-octane jet fuel like JP-4/8. For logistical reasons, the JP-8 is preferred by the US military. This gas turbine was proven quite reliable in practice and in combat conditions but was soon hampered by its equally high fuel consumption, ending in a serious logistic issue. Starting the turbine alone consumed no less than 10 US gallons (38 L) of fuel, and was rated for 1.67 US gallons (6.3 L) for each mile or 60 US gallons (230 L) per hour on flat, much more cross-country and even to 10 US gallons (38 L) when idle. The use of a mine plough could increase these numbers by 25 percent. The M1 uses around 300 gallons in 8 hours for a sustained usage which can depend on the missions specifics, terrain and weather. The refueling process of a single tank takes about 10 minutes and rearming, in addition, a full tank platoon can take around 30 minutes under ideal conditions and with a trained crew. 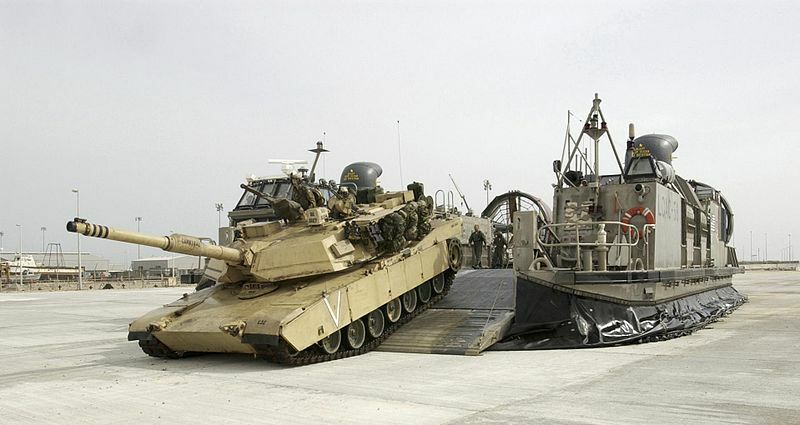 Not surprisingly it is the Achilles heel of the Abrams, restricting its operational range. M1 Abrams Lycoming LGT 1500 turbine schematics. Credits: General Dynamics. Moreover, the turbine own’s high-speed & temperature, equalling a jet blast from the rear prevented the infantry to follow the tank closely, an issue especially in urban combat. However it was very quiet compared to diesel engines, with less resonance when perceived from afar. For this, the M1 was nicknamed “whispering death” during its first REFORGER exercise in Germany. This power was transferred to the ground by a set of seven doubled ruberrized roadwheels (per side) suspended by torsion arms. The first pair was further apart to the front. Another pair acted as tensioners. The High-hardness-steel torsion bars were given rotary shock absorbers and provided an even smoother ride than the M60, while being still compatible with the general ordnance and less complex mechanically, easier to maintain than the original hydropneumatic system. The tracks were of the RISE standard for durability. The driver is laying low in his seat due to the hull’s gacis extreme angle and Reclining. He has at his disposal a full station displaying the condition of vehicle with fluid levels, batteries and electrical equipment (now digitalized) and in some cases a steer-to indicator to find the best tactical route. He can scan for the best ground and the protection offered by the terrain through a set of three observation periscopes (or two and a central image intensifyer for night vision and poor visbility in general; dust, snow, heavy rain, fog…), covering a 120° frontal arc. This AN/VSS-5 image intensifier is developed by Texas Instruments, based on a 328 x 245 element uncooled detector array, working in the 7.5 to 13 micron waveband. For the first time, the Turret was designed from the beginning to operate a laser range finder, a ballistic computer, a gunner thermal-imaging day and night sight, a muzzle reference sensor to measure the gun-tube distortion and a wind sensor. It was a real leap forward compared to previous generations. The crew of three take place inside the central inner turret, with a standard loader instead of an autoloader. The latter was a uniquely shaped pentagram, with a sloped faceted nose, flat sides and rear. Fastening equipments took place all over. The turret was in fact much smaller, but with side composite armour blocks that acted as massive extensions. This was already a modular compartimentation, although the blocks were welded and not just held in place by brackets. The two cupolas (commander to the right and loader to the left) are side by side. The turret is fitted with 2×6 L8A1 (M250) smoke grenade launchers (2×8 for the USMC version) blocking both vision and thermal imaging, and in support a smoke generator triggered by the driver. This system is well known. Fuel is injected into the hot turbine exhaust, creating a massive smoke cloud. But because of the JP-8 used more commonly, this possibility was disabled due to the risk of fire damage in the engine compartment. Active protection consists of the the AN/VLQ-6 Missile Countermeasure Device (MCD) Softkill Active protection system, mounted on the turret, in front of the loader’s hatch. It is box-shaped and fixed into position. The MCD can disrupt SACLOS guidance systems, wire and radio guided ATGMs. It could also thermally blur the infrared image with a condensed, massive emission that confuse the IR view or any targeting acquisition system, when detected, and the missile is left to detonate elsewhere. A view of the gunner’s station (bottom left) and commander station (top right). Credits US Army, public domain. He is situated in the right hand side of the turret, in front of the commander seat. His Primary Sight-Line of Sight GPS-LOS is manufactured by the Electro-Optical Systems Division of Hughes Aircraft Company. It is a single axis stabilized head mirror. Daylight optics has a x10 narrow x3 wide magnification wide field of view on 18 degrees at close range. The night vision Thermal Imaging System has a x10 narrow/ x3 wide agnification field of view. It is a part of the eyepiece of the gunner’s sight, coupled with the range measurement provided by the laser range finder. The two-axis GPS-LOS provides an increased first round hit probability due to fast target acquisition & gun pointing, with a stabilization accuracy/bore sight retention less than 100 microrads. His secondary sight is a Kollmorgen Model 939 with a magnification x8/8°. The Hughes LR is composed of a neodinium yttrium aluminium garnet (Nd:YAG), a laser transmitter, and a receiver. Data transferred and integrated into the FCS in real time. The laser beam reflection provides a time of travel for accurate range measurement with a wavelength of 1.06 microns. The upgraded laser rangefinder includes a Raman resonator decreasing the wavelenght to 1.54 microns, safe for the eye. The laser beam could be emitted at a rate of 1 shot per second. It is accurate within a 32 feets (10 m) margin and target discrimination of 65 feets (20 m). The FCS computer is manufactured by Computing Devices Canada (Ontario). It is composed of an electronics unit, data entry, and test panel. The range data is transferred to computer that calculate the fire control solution. This data includes the lead angle measurement, bend of the gun, wind velocity crossed with data from a pendulum static cant sensor (center of the turret roof). Manual Inputs to the FCS are the ammunition type, temperature and barometric pressure. The commander cupola (right hand side) gets six vision blocks for a 360° panoramic view, a day/night sight periscope with range is -12 to +20° in elevation, with 360 degrees in azimuth and a x2.6 at 3.4° narrow field of view magnification up to x7.7 at 10.4° wide magnification. He can also scan his tank interior condition via the inter vehicular information system (IVIS) and in some cases an appliqué digital screen. He also have an automatic sector scanning, and an automatic target cueing of the gunner’s sight and back-up fire control in case. The commander has a gyrostabilized head for sensors and a hand control grip to selecting parameter settings on a panel, an electronics unit with a remote cathode ray tube display. Usually the system is tailored for the commander to spot the target, then digitally pass the information to the gunner and main FCS that directs the fire, while the commander is already picking the coordinates of the next target. With such flow, it is estimated that the Abrams can neutralize ten targets in the matter of 30 seconds. XM-1 in demonstration at Fort Knox, Kentucky 1979. Credits US Army, public domain. He is seated on the left hand side of the main armament, with a simple two-pieces hatch over him. Inside the turret, he is responsible for loading the main gun with ready rounds (and supplying new ones) and serving the coaxial M240 7.62 mm light machine gun, placed on the right hand side of the main gun. Outside the turret, he could use a secondary 7.62 caliber M240 machine gun placed on a Skate mount. It has a -30 to +65° elevation and 265° traverse. He is well placed inside the tank to vizualise the digital displays and generally scan for targets and antitank guided missile (ATGM), using the detection sensors and activating/maintaing the AN/VLQ-6 MCD active protection system. 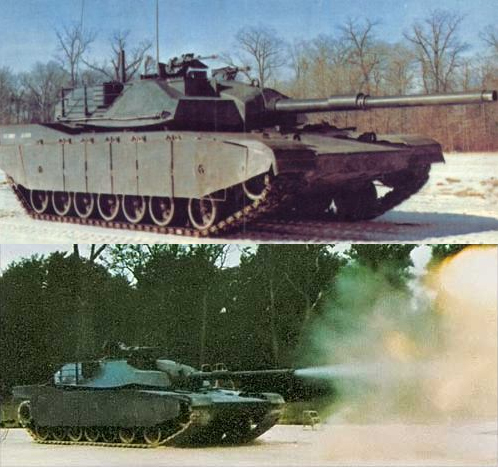 The Ballistics Research Laboratory at Aberdeen Proving Grounds began a crash program for a Chobham-inspired armour in 1978, and the first production M1 in 1981 weighed about sixty tons fully loaded, combining a normal RHA steel armour under a new composite special armor (layers of both steel and composites, heat and shock absorbing materials), proven against any sorts of HEAT and kinetic energy penetrators. The general scheme is derived from the “Burlington” armour tested on the Chieftain. It is a multi-layered armour combining various alloys of steel, sandwiched with ceramics and plastic composites, including kevlar. The order of these layers and relative thickness are top secret and classified. The whole has an equivalent of 1,320–1,620 millimetres (52–64 in) of RHA on the turret front against all chemical energy rounds, and 940–960 mm (37–38 in) for kinetic energy penetrators (APFSDS or “sabot” rounds). The M1 also tried in operations reactive armor over the track skirts to defeat RPGs, mostly encountered in an urban environment, or slat armor (rear and rear fuel cells) against ATGMs. A Kevlar liner prevents any spalling. The very core of the early Abrams was its M60A1 105 mm rifled gun, similar to the one used by both the M60 and the upgraded M48, and licence built after the original British Royal Ordnance L7 gun. The turret is however tailored to accept the German Rheinmetall 120mm gun if necessary. With the advent of more advanced 105 mm rounds like the DU penetrator M833 round, it was possible to delay gun upgrade until 1985 (M1A1), despite the arrival of the T-64 and T-72 in the Soviet arsenal, both armed with 120+ mm guns, in addition to the T-62. The improved M883 round was indeed capable of penetrating 420mm of RHA at 60° at 2,000 meters. Optimal range was 2000 meters which gave the biggest percentage of first hit probability, maximal range was 3000 meters (1.9 miles). For greater range, a bigger round, and a smoothbore gun were necessary, which led to the introduction of the M256 tank gun with the M1A1. Secondary armament comprised a combination of 0.3 and 0.5 caliber machine guns, all located in the turret. The turret top receive the traditional “Madeuce” .50 cal. (12.7 mm) M2HB in front of the commander’s hatch, mounted on the Commander’s Weapons Station, allows it to be aimed and fired from within the tank. With the introduction of the Common Remote Operated Weapons System (CROWS) kit, the M2A1 HMG, M240, or M249 SAW could be adapted to a remote weapons platform (similar to the one used on the Stryker). Transparent gun shields are also prvided, on the TUSK variant. The M1A1 Abrams Integrated Management (AIM) add a thermal sight for night and low-visibility shooting. A 7.62 mm M240 machine gun in placed in front of the loader’s hatch (right-placed skate mount). Some were later fitted with gun shields during the Iraq War, and night-vision scopes for low-visibility and night fighting. The second M240 LMG is in a coaxial mount to the right of the main gun, and fired with the same computer and FCS which operates the main gun. An optional second coaxial 12.7 mm M2HB could be mounted directly above the main gun in a remote weapons platform (TUSK upgrade kit). M1A1 interior cutaway. Credits: General Dynamics. The “IP” stands for “improved performance” and was devised as an armour upgrade for the late production models, 895 briefly delivered in 1984 to the US Army before the introduction of the M1A1. The IP contained a serie of upgrades and modifications like a new turret with thicker frontal armor, referred as the “long” turret and with the armour line of sight thickness raised from an equivalent of ~650 mm to ~880 mm. The IPM1 could be recoignised to their rear turret basket, placement of the antennae and wind sensors, turret lenght (seen from above), and improved frontal suspensions, to deal with the added weight on the turret front, and the most distinctive difference is the absence of the retainer ring on the rear drive sprocket and modified side skirt section above it. The major upgrade of the Abrams, centered around a new 120 mm smoothbore gun and a series of protection improvements and other upgrades, designed to keep pace with contemporary advanced Soviet designs such as the T-64A, upgraded T-72, and the T-80. External differences are easy to spot: The turret is the “long” model, at the rear with a rear bustle rack for improved stowage, a thicker front armour, new blast doors, new engine compartment access doors, reinforced suspensions, pressurized NBC system, the absence of drive sprocket ring retainer, and moreover the shorter and thicker gun barrel and more massive bore recuperator. M1E1, first prototype for the M1A1, 1984. The add-on appliqué armor are provisional for the field tests. Credits: S.Zaloga. The first series in 1985 were equipped with the same armour, but improved turret armour as seen on the late production M1IP. However, starting in 1987, the M1A1 received improved armor packages incorporating depleted uranium (DU) components, under “Heavy Armor” (HA) upgrade name. These were located to the front of the turret and hull, and believed to add an equivalent to 24 inches (610 mm) of RHA. This combination increased resistance towards most AP rounds, but added a considerable weight due to a 1.7 times superior density compared to lead. The first M1A1 so upgraded were stationed in Germany, in first line against the Soviet Union. In 1991 (during Desert storm) some US-based tank battalions received an emergency HA upgrade shortly after the beginning of operations. 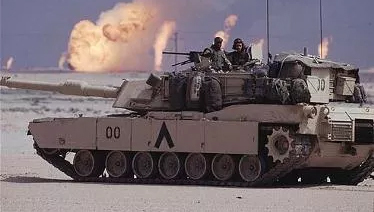 The later M1A2 tanks had an uniform depleted uranium armor (not only the front), but received engine upgrades in the meantime to deal with the additional weight. To this day, all M1A1 tanks in active service have been upgraded to this standard. Nowadays upgrades practiced on older models includes depleted uranium armor, and the M1A1 AIM FCS and the M1A1D digital enhancement package. There is also a commonality program to standardize parts between the U.S. Army and the Marine Corps M1A1s resulting in the M1A1HC. M256 120 mm smoothbore L44 main gun schematics. Credits: general Dynamics. The German Rheinmetall 120mm smoothbore cannon served as a model for the new US gun. This gun was used by all versions of the new Leopard II, until the arrival of the L55 on the Leopard IIA6. However US studies concluded prior to its adoption that this tank gun was overly complex and expensive by American engineering standards. A simpler version with fewer parts was quickly developed. It had a completely redesigned coilspring recoil system (no more hydraulic). US Ordnance adopted the new tank gun as the 120 mm M256 and it was produced by Watervliet Arsenal, New York. Along with its adoption, many adjustments had to be made to the turret interior, ammunition management, fire control system and storage facilities inside the hull for the new bigger rounds. The larger bore also meant new and more varied ammunitions could be used and the gunners were trained accordingly. There are plans today to upgrade this gun to the new German standard L55, but still, the M829 APFSDS ammunitions already fired had the same kinetic energy than the German L55 fired tungsten penetrators (around 18-20 megajoules). There are a lot of pros and cons to use the new caliber, the most obvious one being the greater muzzle velocity which can be achieved with older ammunitions. However comprehensive testing will have to be done to ensure that the current munitions will behave properly with this new caliber. As of 2015, programs with the new gun are still pending due to their cost compared to upgrades on the existing rounds. M1A1 turret details (General Dynamics). Perhaps the most famous ammunition set for the new gun was the M829A1 APFSDS-T (1991). This kinetic energy penetrator (long rod), is made of depleted uranium. It could reach a muzzle velocity of 1,575 m/sec, with a maximum effective range of 3,500 meters. During Operation Desert Storm some M1A1 demonstrated that a 4000 m reach was possible and scored several registered kills this far away. Nicknamed the “Silver Bullet” this ammunition gained fame thanks to the 1991 campaign at the same time this ordnance was first introduced and used operationally. The DU (Depleted Uranium) “sabot” round is a nasty piece of ordinance. The “dart” is much smaller than the launching envelope, called the “discarding sabot petals”, so in essence it is supposed to pack less punch. But the final speed it reaches combined to its very high density creates a “pyrophoric” effect when hitting an armour plate. Both the penetrator and the steel are melted due to the tremendous pressure, creating a temperature high enough to carve a pathway right through 610 mm equivalent RHA of armour plate at 2,000 meters, projecting what left of this process inside the turret. This causes untold injuries, and everything in the path of the jet could catch fire, including stored ammunitions. The APFSDS-T M829A2 (1994) replaced the former M892A1, and was produced by the General Dynamics Ordnance and Tactical Systems. It includes the use of a new manufacturing process to improve the DU penetrator strenght. The sabot envelope itself is made lighter because of alloys and composites. This is combined to a new propellant for greater muzzle velocity, around 100 m/sec greater than before or 1,675 m/sec but at slightly lower pressure. It is estimated by expert to be able to defeat 730 mm equivalent of RHA at 2,000 meters. It is gradually replaced by the most effective round so far, the M829A3. Specifics and performances are classified, but the round itself is 10 kgs (much heavuer than the A2 (4.6 kgs) or A1 (4.9 kgs). Increased accuracy and range resulted in an estimated Muzzle Velocity of 1,555 m/sec and penetration performance of 765 mm at 2,000 meters. This round is now made by the Alliant Techsystems Inc. (ATK) based in Rocket Center, West Virginia. The other rounds usually carried includes the M829 (1985) AP round, and the M830 High Explosive Anti-Tank (HEAT). The latter has a maximum effective range of 3,000 meters. New ammunitions in developement outside the “sabot” are intended to deal with new generation of Russian armour systems like the Kontakt-5 ERA pack, and its modernized variants like the “Kaktus” type. M1A1HA (Heavy Armor): Added 1st generation depleted uranium armor components. Some tanks were later upgraded with 2nd generation depleted uranium armor components, and are unofficially designated M1A1HA+. M1A1HC (Heavy Common): Added new 2nd generation depleted uranium armor components, digital engine control and other small upgrades common between Army and Marine Corps tanks. M1A1D (Digital): A digital upgrade for the M1A1HC, to keep up with M1A2SEP, manufactured in quantity for only 2 battalions. 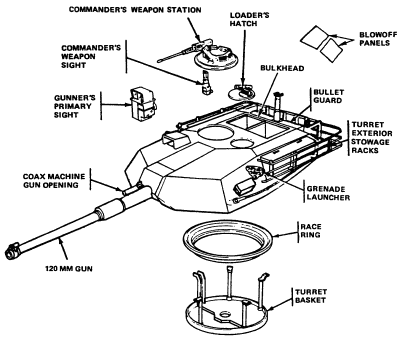 M1A1AIM v.1 (Abrams Integrated Management): Complete overhaul (see later). M1A1AIM v.2: Added new 3rd generation depleted uranium armor components. M1A1FEP (Firepower Enhancement Package): AIM v.2 for USMC tanks. M1A1KVT (Krasnovian Variant Tank) visually modified to resemble Soviet-made tanks for use at the National Training Center. M1A1M: The export variant ordered by the Iraqi Army. M1A1SA (Special Armor): configuration for the Royal Moroccan Army. The M1A2 is the sum of improvements over the M1A1, but moreover and brand new FCS with a powerful computerized core, and consisted in a commander’s independent thermal viewer and weapon station, a new position navigation equipment, and other controls and displays managed by a central digital data bus. More data can be treated simultaneously, improving the tank first hit probabilty, range, and rate of fire altogether. Replacement of the ATG 1500 turbine on the field. 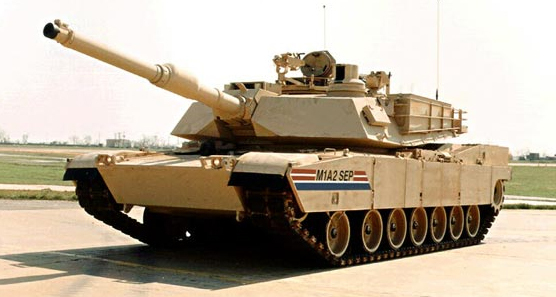 The SEP (System Enhancement Package), or “M1A2 Tank FY 2000” configuration was first applied to tanks in service with the 1st cavalry division based in Fort Hood, Texas. It comprised a Second Generation Forward Looking Infared (2nd Gen FLIR) sight, digital maps and FBCB2 capabilities, along with a better cooling system to cope with the additional heat created by these equipments and a thermal management system. Target detection, recognition, identification are improved and coupled with the Firepower Enhancement Package (FEP). The FCS computer is upgraded with increased memory and faster processors, full color map display and compatibility with the Army Command and Control Architecture; This allows each tank to be monitored and exchange informations in real with the unit command, sharing better situational awareness with other units in the process. The Under Armor Auxiliary Power Unit (UAAPU) provided the extra power required. Developed by the TARDEC US Army lab, this was a high power density 330 cc (20 cu in) Wankel rotary engine, modified to operate with various fuels, especially the high octane military grade jet fuel. The armour upgrade consists of a third generation steel with sandwiched depleted uranium armor layers. The entire retrofit program was to be applied to the entire fleet ot M1A2, M1A1 and M1s, but in 2004 this was curtailed due to funds shortages and priority given to the Stryker and Future Combat Systems (FCS) programs. M1A1 SEP – US Army archives. 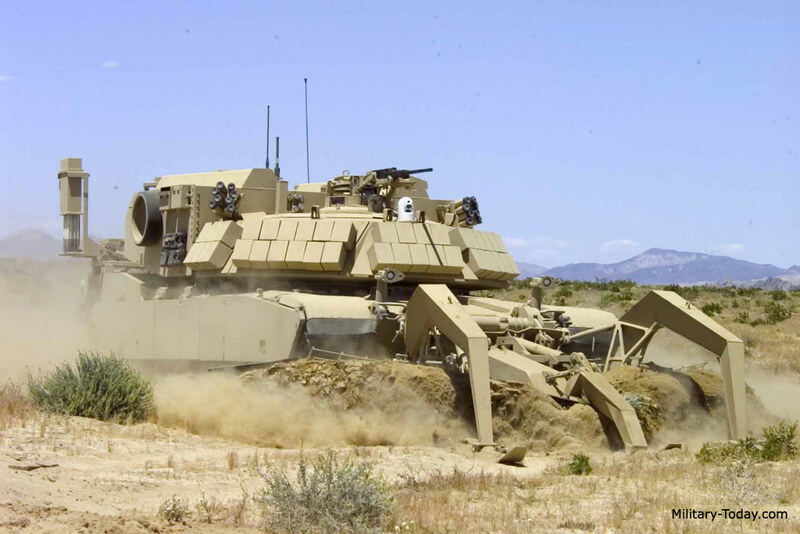 The SEPv2 (version 2) is a joint program led by US Army TACOM and General Dynamics Land Systems. This second upgrade package consists of an increase of reliability and durability of various components and systems (like RISE was for the M60), and various technology upgrades. The first contract was signed on November 2007, for the upgrade of 240 M1A2 SEP. This includes a whole set of new displays, improved sights, more intuitive and exhautive interfaces, a new operating system, and a tank-infantry phone. Other aspects includes protections enancements with a better front and side armor, and better suspended and reworked transmission to increase durability. Phase II was done in 2008-2009 for the remaining 434 M1A1s in the inventory. Total for these includes 240 new constructions, 300 M1A2s upgraded to M1A2SEP, unknown numbers of upgraded basic M1s and M1IPs, and 400 oldest M1A1s upgraded to M1A2SEP. The FEP upgrade was awarded to DRS Techologies for the GEN II TIS destined to the US Marine Corps M1A1 tanks. This system comprises a 480 x 4 SADA (Standard Advanced Dewar Assembly) detector, an eyesafe laser rangefinder, a north-finding module and precision lightweight global positioning receiver. These enable the new Far Target Locate (FTL) targeting solution capability. This subsystem provides accurate targeting data to a range of 8,000 m with a 114 feets (35 m) Circular Error of Probability. This system extends the firing range into uncharted territories, a below-horizon capability with the earth curvature taken in account in what it is barely a “direct fire” anymore. M1A2 with TUSK I composition (Tank Urban Survival Kit) for urban battles. Credits US Army – public domain. The Common Remotely Operated Weapon Station is called CROWS (or CROWS II). This remote-control weapon system is compatible with a variety of military platforms. It also includes a laser range finder and a miniaturized sensor suite to be kept operational under the worst conditions. Five time more .50-cal. can be stored. 370 CROWs II kits were installed. They are often combined with the TUSK upgrade to be deployed (and battle-tested) in Iraq, and inspired by the Israeli experience with these systems. Called Tank Urban Survival Kit this program was aimed to improve the tank survivability in an urban environment where threats can be located in any directions, including over the tank. Basically, the side, rear and top armour is enhanced. These armor upgrades include ERA blocks fit on the side skirts to defend against ATGMs, as well as slat armor on the rear to protect against RPGs and other shaped charge warheads (ARAT). This is usually accompanied by a remote-controlled firing platform (CROWS) and/or a transparent armor gun shield (LAGS) and Remote Thermal Sight system (RTS) and Power Distribution Box (PDB) for the loader’s external 7.62 mm LMG and 12.7 mm HMG (Kongsberg Gruppen Remote Weapon Turret) of the commander. 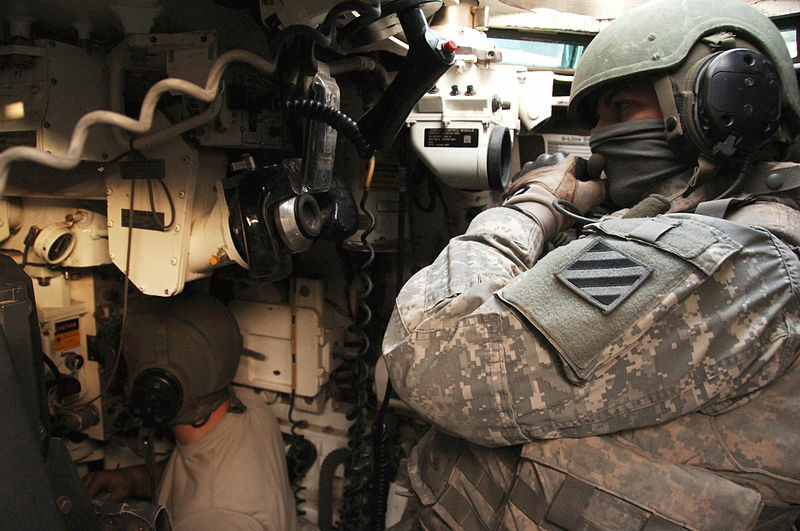 An exterior telephone with infantry (TIPS) is also fitted to communicate directly with the tank commander. These kits were made available for field conversions in the areas of operations, mostly in Iraq, without the need of reaching a maintenance depot. Contract was awarded in 29 August 2006 to General Dynamics Land Systems for 505 kist under a US$45 million contract, completed in april 2009. 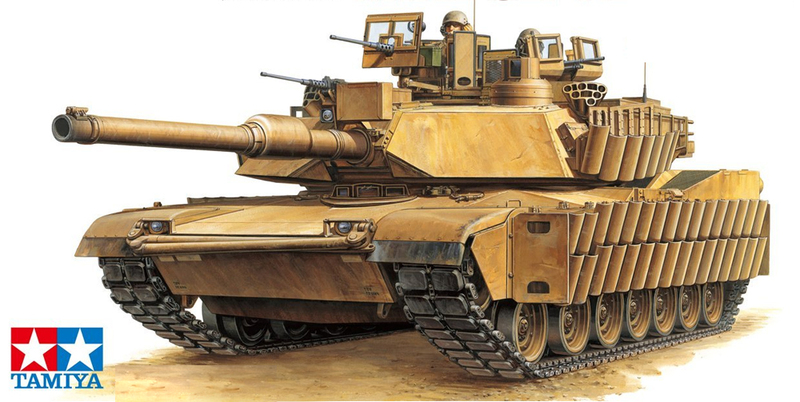 M1A2 TUSK II – Tamiya artist impression. 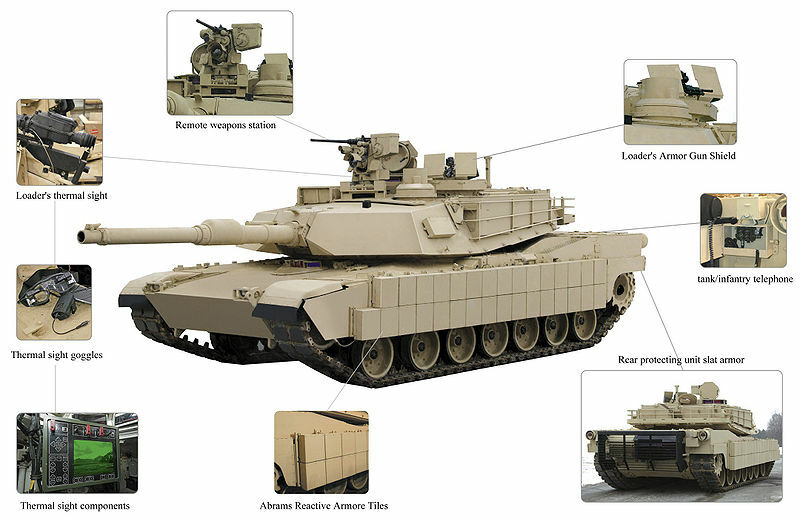 The Continuous Electronics Enhancement Program (CEEP) comprises the latest System Enhancement Package (SEP) and the Tank Urban Survivability Kit (TUSK) both for M1A1 and M1A2s operating in Iraq and Afghanistan. This program comprises advanced digital systems and better compatibility for the Army’s future combat systems integration. It is a retrofit for SEP models. This comprises more detailed HD color maps, better sensor imagery and a more efficient situational and combined arms tactical display. Wireless technologies is enable for remote diagnostics, vehicle monitoring and remote command and control capability in the field. All crew members had to receive individual displays and a better intra-vehicular connectivity. New, more efficient batteries are provided in place of the noisy auxiliary power unit. The AGT 1500 turbine engine is getting old (last produced in 1992) and poses problems of maintenance, of declining reliability, fuel consumption and o&s costs that should be adressed. A two-phased PROSE (Partnership for Reduced O&S Costs, Engine) program was devised first to improve the engine readiness at lower costs, then to overhaul the existing components (Total InteGrated Engine Revitalization or TIGER program). This program is aimed at reducing the overall operating costs while doubling the service life of the turbines. The second phase is a full replacement by a new engine, with the global aim to improve reliability by 30%. Honeywell International Engines and Systems and General Electric were both selectioned to develop a new LV100-5 gas turbine engine for the M1A2, lighter and smaller with better acceleration, quieter and with a much reduced thermal signature. The XM2001 Crusader program featured also a 33% reduction in fuel consumption (50% less when idle) and easier replacement, but it was terminated due to budget cuts. This latest version is under development, prototypes were delivered in 2014, and operational production was estimated to be by 2017, when the Army first planned to re-launch the Lima tank plant production. The sum of improvements includes a lighter L44 120 mm gun, new road wheels with improved suspension and a more durable track, a lighter armor and long-range precision armaments (for ranges up to 8000 m), upgraded infrared camera and laser detectors. A new internal computer for the FCS is scheduled, relied with fiber-optic lines, also to gain weight. As of today, the M1A3 is delayed to FY2018. Total : 8800 – 3273 M1 (US Army), 4796 M1A1 (US Army + USMC), 755 m1A1 co-produced in Egypt, 77 M1A2 for the US Army, 315 for Saudi Arabia, 218 for kuwait. The original builder, Chrysler Defense, ceased to built the Abrams in 1995, which was to be followed by the Lima Army Tank Plant in 2013 as planned by the Army. However General Dynamics Land Systems (GDLS) opposed the Army decision to postpone the production until 2017, and estimated the costs for shutting down the factory and restarting the production to be higher than a continuous run. By 1999, the cost of a single tank was estimated to US$5 million and soared since then due to more complex FCS systems and communication upgrades. The production was eventually resumed, pending the FY2017 full restart and/or foreign sales, and in the meantime, overhauls are maintaining the activity. The Abrams Integrated Management (AIM) program overhauls old M1A1s to original factory standards, a program first initiated in 1997. First step is performed at the Anniston Army Depot in Alabama, since 1998. Hulls are separated from the turrets, components are uninstalled, treated and stored separately. Both hulls and turrets are sandblasted until retreiving the original bare steel finish. These are stored, then sent by rail to the Lima Army Tank Plant in Ohio for complete upgrade, re-assembly (including the turret-hull “marriage”) and tests before delivery. These upgrades includes a Forward-Looking Infra-Red (FLIR) and Far Target Locate sensors, tank-infantry phone, full communications suite (FBCB2 & Blue Force Tracking) for crew situational awareness, and a thermal sight for the .50 caliber machine gun. There are still some questions about the Abrams relevance as a potential 4th generation MBT in the next twenty years. A tank is not a nuclear aircraft carrier, and although the upgrade process could be done indefinitely, there are regular concerns about future weapons systems in adequacy to new (mostly asymetric) threats, and cheaper vehicles to operate and maintain alongside MBTs for low intensity conflict zones, like the M8 Armored Gun System. But the U.S. Army’s Future Combat Systems XM1202 Mounted Combat System was not funded, and the M1A3 program was delayed due to budget restrictions for an adoption scheduled in 2018. The Pentagon finds itself in the peculiar position of facing Congressional support for an apparently unwanted refurbishment program instead of funding properly a new generation of vehicles that are thought more appropriate to deal with current asymetric threats. Did an “hibernation” process in the Sierra Army Depot (as the Iowa class ww2 battleships) should be considered as an option ? Officially the 1st generation M1A1 are planned to remain in service at least until 2021 and 2040 for the M1A2/A3s. M1 TTB (Tank Test Bed): Prototype with unmanned turret, the crew is housed in an armored capsule in front of the hull, remotelly operated 120 mm smoothbore gun and autoloader. CATTB (Component Advanced Technology Test Bed – 1987–1988): 140 mm smoothbore gun test vehicle with upgraded hull with an autoloader, new engine and other upgrades. M1 Grizzly CMV: Engineering vehicle. Tested but cancelled in 2001. M1 Panther II Remote Controlled Mine Clearing Vehicle: turretless, equipped with minerollers and a .50 Cal (12.7mm) MG for self defence. Production unknown. Saw action in Bosnia, Kosovo and Iraq. M104 Wolverine Heavy Assault Bridge: Current US Army heavy bridgelayer, tested in 1996 to replace the slower M60 AVLB, 44 delivered so far from 2003. M1150 Assault Breacher Vehicle: USMC variant with a full-width mine plow, two linear demolition charges, lane-marking system, protected by ERA. Small turret with two rear-mounted MICLIC launchers and remote M2HB HMG, grenade launchers. M1 ARV: Armored Recovery Vehicle (prototype only). The US Army operates today some 1,174 M1A2 and M1A2SEP variants, and 4,393 M1A1 and variants, while the USMC fielding 403 M1A1 FEP. Potential customers includes Greece (400 ex M1A1 tanks offered in 2011, 90 apparently procured in 2012. This new was debunked since). For Morocco 200 surplus M1A1s were requested in 2011, including a Special Armor (SA) configuration, refurbishment and associated parts, but this is yet to be confirmed. Peru in May 2013 ordered comparative tests to find a replacement for the T-55s. The Taiwanese government also considered placing an order for 200 overhauled M1A1s. The Australian Army acquired some 59 revalorized M1A1 (AIM) mixing U.S. Army/U.S.M.C equipment and without HA (depleted uranium layers in armor) in 2006, to replace the Leopard AS1. 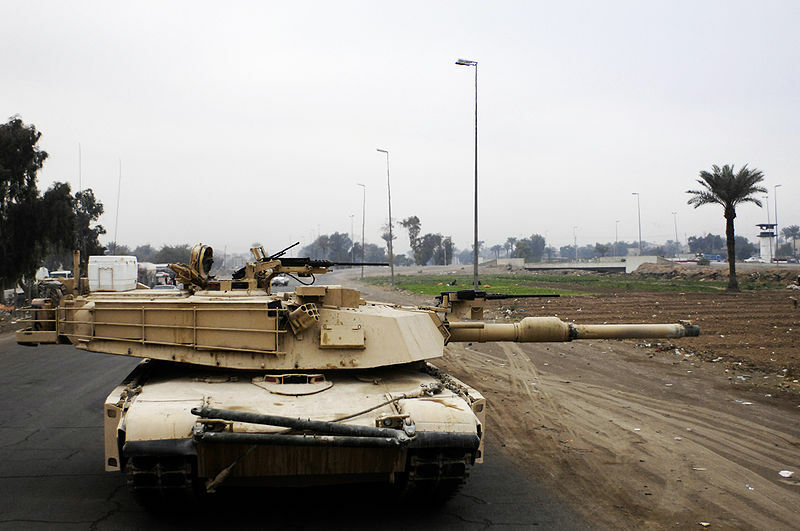 The Egyptian Army took delivery of 1,005 M1A1s co-produced by the US and Egypt and another 200 on order. The Iraqi Army were provided 140 M1A1Ms (downgraded, without HA). 22 U.S. Army M1A1s were also lend for training in 2008-2011. During the June 2014 Northern Iraq offensive, the Islamic State operated an estimated 30 captured ex-Iraqi M1A1Ms. The Saudi Arabian Army took delivery of 373 Abrams tanks M1A2, in the process of being upgraded to M1A2S configuration, with 69 more delivered until 31 July 2014. The first active unit receiving the M1 Abrams (at that time the first serie was still called “XM-1”) was the 1st armoured division in 1980. The best units operating in Europe (stationed in germany for the most) shifted their M60A3s for this new model. They participated in numerous NATO exercizes in Western Europe (mostly West Germany) in combination with M60A3s and related Leopard-IIs until the fall of the berlin wall, but also in South Korea. In USA various exercizes saw a large variety of 1-tones seasonal camouflage patterns being tested (MERDC), later abandoned for the olive drab. NATO Black/Med-Green/Dark-Brown standard CARC (Chemical Agent Resistant Coating) pattern were also applied for some time to M1s deployed in Northern Europe. In Iraq however, the tanks were painted in desert tan. With the following operations in the 2000s in Afghanistan and Iraq, some repaired tanks showed a mix of parts in desert tan and olive drab depending of the depot supplies. Nowadays only the Australian tanks shows a 3-tone disruptive camouflage made of black, olive drab and brown. Strategic mobility was provided by a C-5 Galaxy or C-17 Globemaster III, but with quite a limited capacity (2 for a C-5, and 1 in a C-17), causing an lengthy deployment and serious logistical problems during first Persian Gulf War. Eventually the bulk of the 1,848 tanks deployed for the operation were shipped by sea. The USMCs Abrams could be carried by the Wasp-class LHDs which generally could land a platoon (4-5 tanks) attached a Marine Expeditionary Unit, or transported by LCACs to the shore (1 combat-ready tank each). By road, the M1070 Heavy Equipment Transporter (HET) truck usually carries the M1, with reasonable cross-country capabilities, and even accommodates the 4 tank crewmen. First operational airlifts into a battlefield zone occurred in April 2003 (belonging to the 1st Infantry Division) in northern Iraq from Ramstein, Germany. By 1991 and the Operation Desert Storm, resulting from the invasion of Kuwait by Iraqi forces in 1990 the M1 Abrams were deployed operationally for their first major action. This was the biggest test so far for any american tank against an army alledged to be the world’s fouth largest army, a fact later refuted by experts and largely made up by media corporations to raise audiences. At that time the bulk of the army deployed to Saudi Arabia comprised M1A1s, which introduced for the first time the new APFSDS “sabot” round. These tanks encountered a mix of T-55, T-62s, T-72s from ex-Soviet and Polish stocks and possibly local downgraded “Saddams”, a T-72M variant. Their general readiness and combat capabilities were further limited by the lack of modern night vision systems and rangefinders. After the bombing campaign which destroyed many of the enemy armour, the ground operation saw several battles where the M1s distinguished themselves. In fact, none of the tanks engaged was reported as a total loss, crew included. 23 M1A1s were damaged to more or less great extent, some fatally, but with no casualty. Of the nine destroyed, seven were so by friendly fire. By contrast, over 250 enemy tanks were claimed, many kills being scored at ranges in excess of 2,500 metres (8,200 ft), and some in very poor visibility. There was however a few cases of friendly fires which included direct hits with M829A1 “Silver Bullet” APFSDS rounds, which all were survived, and one including an intentional attempt to destroy an abandoned Abrams stuck in the mud, which failed. The battle of Khafji: In 29 january 1991 was the first major ground engagement for mostly USMCs M60A1/A3s but also some M1A1s counter-attacking the captured of the Saudi city of Khafji by the Iraqi Third Corps, spearheaded by the 3rd Armored Division and 5th Mechanized Division, the only non-Republican guards equipped with T-72s. The opposing Saudi forces deployed AMX-30 tanks, V-150 and LAV-25 wheeled vehicles. American units engaged were the 1st Marine Division, 2nd Light Armored Infantry Battalion and 2nd Marine Division but most of the kills came from a massive air support as the city was retaken two days later. At the battle of 73 Easting: In 26 february 1991, the 2nd Armored Cavalry Regiment (2nd ACR) stumbled upon a far superior, entrenched Iraqi Republican Guard’s brigade. M1 Abrams destroyed 21 T-72s in the first unit spotted. In total the only allied loss (British troops were also deployed) was a Bradley IFV (one killed) whereas the unit claimed 85 tanks, 40 AFVs, 30 wheeled vehicles, two artillery batteries and about 600-1000 killed or wounded. At the battle of Medina ridge: The following day, the 1st Armoured division clashed with the 2nd Brigade of the Iraqi Republican Guard Medina Luminous Division outside Basra. This resulted in a decisive engagement, with 61 to 186 Iraqi tanks destroyed (most of the T-72 type), and 127 AFVs destroyed, for no losses but 4 tanks damaged. The M1 were greatly helped however by attack helicopters and A10 thunderbolt II in strafing attacks. Several lessons were retained from this operation. The most obvious one was linked to the rate of losses occured due to friendly fire. Abrams but also other U.S. combat vehicles were systematically fitted with Combat Identification Panels for better recoignition, fitted on the sides and rear of the turret. The most characteristic aspects were the flat panels with a four-cornered “box” image placed on the turret front both sides. A secondary storage bin on the back of the bustle rack was also often added (referred to as a bustle rack extension) as it was shown the crews needed to carry more supplies and personal belongings to remain autonomous in operations. The previous operation Desert Storm left a sizeable part of the Iraqi Army safe, and the 2001 terrorist attacks and following events led to invade iraq in 2003. The battle of Bagdad was the most serious engagement of US forces so far, with many engagements following in the aftermath of Saddam’s Hussein capture and sentence. As of March 2005, approximately 80 Abrams tanks were registered of action by enemy attacks. One of these fights involved a platoon of M1A1s, claiming the total destruction of seven T-72s in a point-blank skirmish (46 m) near Mahmoudiyah, south of Baghdad. Due to the urban nature of the folowing engagements, some crews were issued M136 AT4 shoulder-fired anti-tank weapons to cover the tank in case the main gun was unable to be brought to bear due to tight spaces. Cases of Abrams irrecoverably lost due to mobility or other problems were often destroyed by other Abrams to prevent their capture. Several cases were due to resolute ambushes by Iraqi infantrymen using well-known tactics in Urban environments. Some aimed their short-range anti-tank rockets on tracks, and on the rear and top of the tank to great effect due to the relative lack of armor. The flammable fuel stored externally in the lightly protected turret racks were also a cause of a fire that disabled the turbine, when finding their way into the engine compartment. 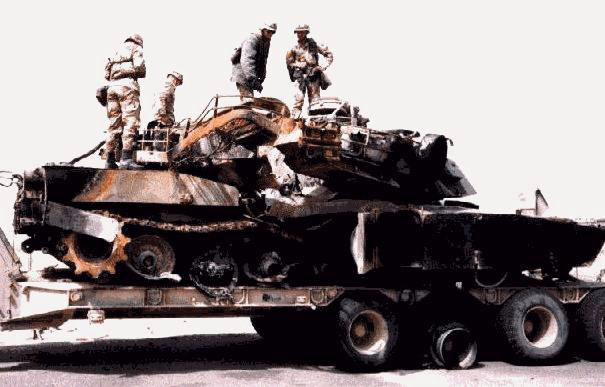 Post-invasion, a growing number of Abrams were frequently damaged by improvised explosive devices (IEDs). The amount of losses far exceeded those of the 1991 operations, but the lenght of this protacted fight and the nature of combat (urban) also was a factor. 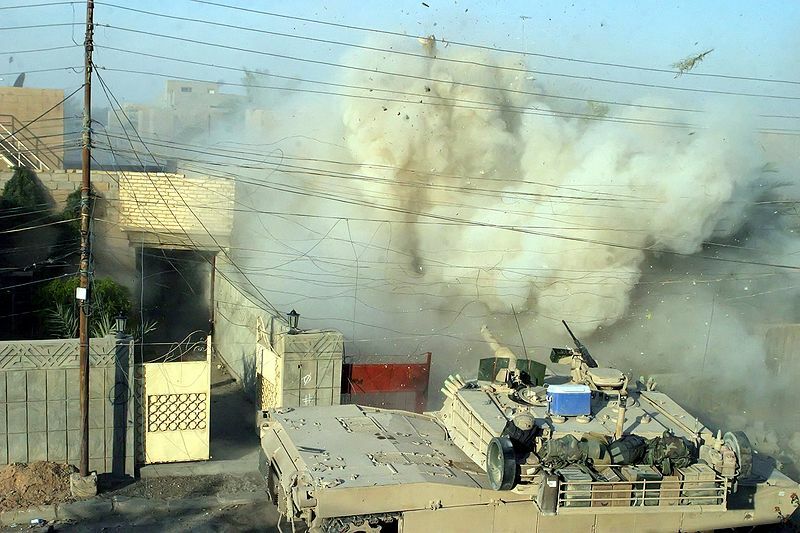 The 1st battle of Fallujah (april 2004): One of the most notorious engagement of the post-invasion era was urban in nature, but involved M1A1 Abrams engaged by the Marines as bait, to lure defenders out into the open. Apparently however this ruse quickly faded as it was reported that “The enemy (…) would initiate an ambush with small-arms fire on one side of a tank in order to get the tank crew to turn its armor in the direction of fire. They would then fire a coordinated 5 or 6 RPG [rocket propelled grenade] salvo into the exposed rear of the tank” (wikileaks). By December 2006, a report stated that more than 530 Abrams had been shipped back to the U.S. for extensive repairs. In the meantime the Tank Urban Survival Kit (TUSK) was issued to some tanks operating in the most sensible areas. By may 2008, another reported a damage caused by an RPG-29, (tandem-charge HEAT warhead) developed in Russia to penetrate not only the layer of explosive reactive armor (ERA) blocks, but also the composite armor behind it. This created a schock among the head of staff and even conducted other operations with Abrams without appropriate modifications, and jeopardized the planned purchased of Abrams to the newly formed Iraqi Army, fearing these would be captured by insurgents. This would be realized indeed in 2013-2014 in the hands of ISIL combatants. Eventually by mid-2014 after the planned retirement of occupation US troops in Iraq, the Iraqi Abrams saw action in the north when the Islamic State of Iraq and Syria launched the June 2014 Northern Iraq offensive. Some M1A1Ms (overhauled) were destroyed in fighting against ISIL forces and other were reported captured in various conditions. At least one was reportedly used by ISIL fighters in the Battle for Mosul Dam in early August 2014. M1A1/M1A2s deployed there, from various strongpoints and camps were free of tank to tank fights, most mission being conducted in infantry support and patrols. This also changed the missions and configuration of the tanks from a wide open-space terrain, to mountaineous terrains that favoured helicopter-deployments instead, and limited urban warfare (villages for the most). Ambushes could be fatal due to a wide variety of weapons which can be used from various angles by the Talibans. SPGs for the most, but also ATGMs, mines, and especially the infamous IEDs, which can be built quickly and detonate remotelly using a cellular telephone. M1A2 TUSK of the 26th heavy mechanized division in Iraq. Therefore the emphasis was put on urban survival, using a great deal of the Israeli experience which goes back as far as the Lebanon conflict in the 1980s. The urdan cupola was example of the US Army pushing the adoption of a system developed on American tanks used by the Irsaelis in an urban environment. But the particular situation in these areas led the the US Army to devise kits and packages with extra armor or protections systems that can be fitted easily in the field, without sending the tank to a depot. The CROWS and CROWS II systems are part of these. Large shields, partly made of bulletproof glass, plexiglas or transparent composites found their way on the secondary weapons. For night vision, individual thermal sights and sensors were added. New remote-controlled weapon systems were introduced, especially for the cal.50 HMG. The second was for the tank weak points (the front is traditionally well armored) by fitting extra ERA protection to the side, rear and extra armour on the turret and engine deck as well. To defend against RPGs and other shaped charge projectiles, the easiest and lightest way was to fit a simple metal grid (slat armor) on the sides and rear, this time the fruit of Russian experience in Afghanistan and Chechnya. The actual upgrades are led by the US Army’s Force XXI Battle Command, Brigade and Below (FBCB2) program. This includes rugged appliqué computers and modular cells, and under the FBCB2 standard, the digital battle command information system is aimed to enhance and explore the interoperability and situation awareness from brigade to individual soldier, using also personal interfaces, with a broader and faster connectivity on the internet. Tests with 3d virtual reality googles (like Oculus rift) for external awareness could be also part of these future upgrades. The latter are to be provided to the drivers, following a succesful campaing in the Danish Army this year. And above all (early part): M1 Abrams Main Battle Tank 1982-92, Stevens Zaloga, Peter Sarson, New Vanguard, Osprey Publishing, 1993. Propulsion Honeywell AGT1500C multi-fuel turbine 1,500 shp (1,120 kW). 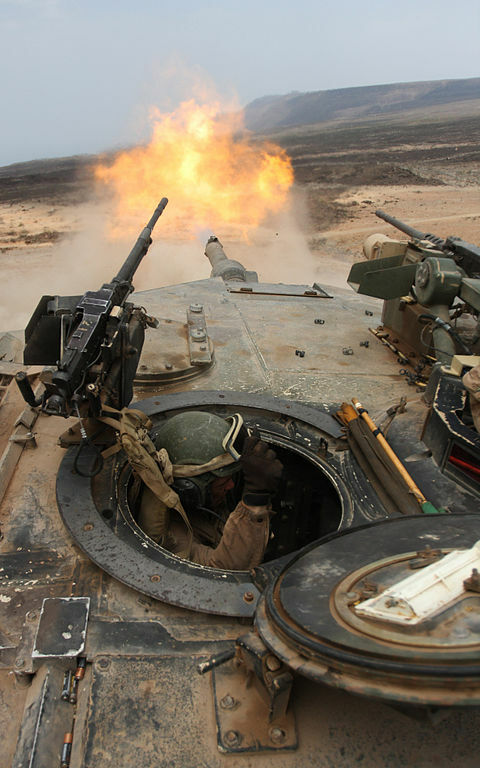 M-1 Abrams from the Battalion Landing Team 1st Battalion, 9th Marine Regiment, 24th Marine Expeditionary Unit in live firing, showing the open loader’s hatch. Credits US Army, public domain. MBT-70 number five prototype (1969) now on display at the Aberdeen proving grounds. XM1 Abrams of the first serie (1979), with the distinctive personal insigna of Col. C.Abrams on his tank during ww2. Here follows several MERDC liveries, in the 1980s. The MERDC (US. Mobility Equipment Research & Design Command) experimented, a system of camouflage patterns for US Army vehicles, standardized patterns composed of up to twelve colours, adapted to each theatre of operation, areas and seasons. These patterns were applied only to a part of the US Army/USMC fleet of M1 Abrams, in the 1980s. The exemple here is the “snow, temperate, with open terrain” pattern. MERDC “Europe Summer, Verdant” pattern. It was expected in theory to change one or two colour while keeping the same scheme to be adapted to any season. In practice this was hardly respected. MERDC “Snow, temperate, with trees & shrubs” pattern. These patterns combined hard edges (hand-painted) and more commonly soft edges (spray-painted). MERDC “Winter, US & Europe, verdant” pattern. MERDC “Red Desert” pattern. MERDC colour patterns came to an end in the early 1990s. Now there are very rare, due to turn-in requirements. 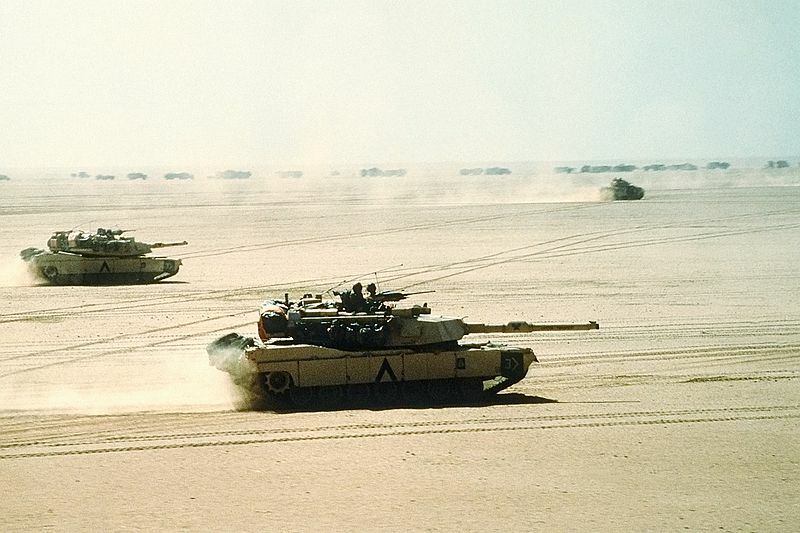 M1 Abrams 2nd armoured division Demo Team, Saudi Arabia 1983. M1 from the Delta Company, 1st Batallion, 64th Armor, 3rd Infantry Division, Germany, in a singular winter livery. Another M1 from the 1/11th ACAV at Reforger 83. These tanks were adorned with tree branches and patches of mud as a deception. M1 Abrams from the 3/64th Armor, 3rd Infantry Division, Germany, 1985. 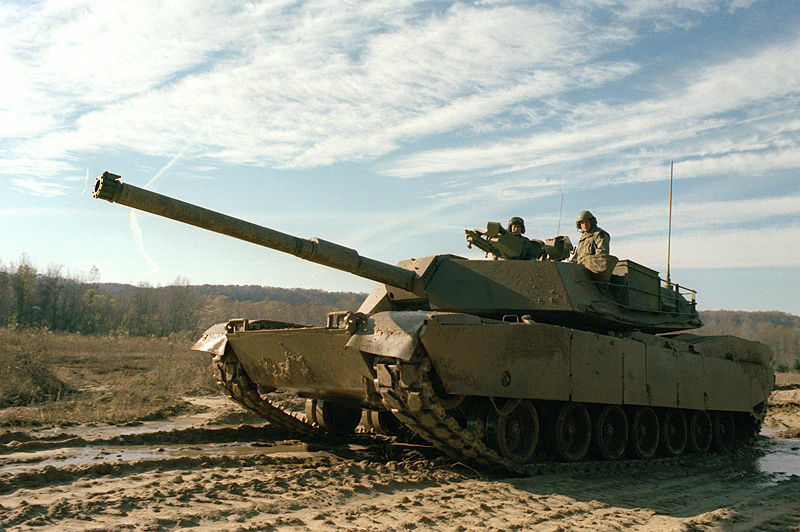 IPM1 Abrams with a transitional washable winter paint, over solid green, late 1980s. M1E1, experimental prototype for the new M286 L44 gun, 1984. M1A1 Abrams of the first serie tested in the Mojave desert, in desert tan livery, 1986. USMC M1A1HA of the 2nd Platoon, 1st Company, 1st Marines Division, fitted with CIP, TI phone, EPLRS antenna, fall 1990s. M1A1-HA from the 4th cavalry, IFOR, Bosnia 1996. USMC M1A1HA of the 1st Platoon, A Company, Regimental Combat Team 1, fall 1990s. US Army M1A1 ODS of the 5th Armoured Division in Kurdistan. M1A1-HA 4th Tank Gun 4th Platoon, B Company, 3-7 cavalry. M1A1-HA with a mine plough. US Army M1A1 HA Abrams 12th platoon, A Company, 1/64 armoured regiment, 2nd brigade 3rd Infantry Division “Rock of the Marne”, Iraq march 2003. Australian M1A1 AIM SA ERA in the 2000s. US Army M1A1 HA of the US Army 4th Tang gun 3th platoon, A Company, 1/33 armor, in the 2000s. 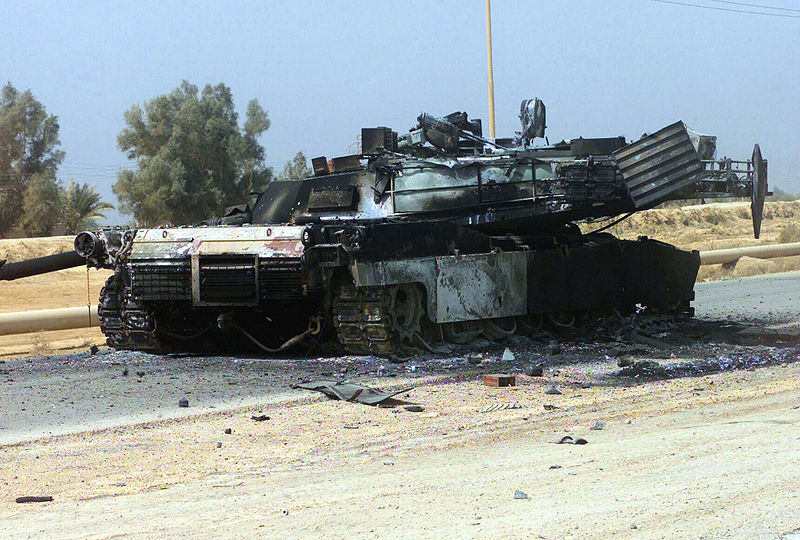 Worn-out M1A1HA Abrams from an USMC unit in Iraq, 2003. Notice the green original roadwheel paint under the faded desert tan color. US Army M1A2 SEP, official prototype by General Dynamics in 1995. M1A2 Abrams, unknown unit of the US Army in Iraq in 2003. Partly camouflaged M1A2 Abrams, unknown unit, Iraq, 2000s. M1A2 of the US Army 2nd Platoon, F company, 2nd Batallion, 3th Armored cavalry Regiment in Iraq in april 2003. US Army M1A2 TUSK I of the 26th Heavy Mechanized Infantry Division in Iraq, in the 2000s. US Army M1A2 SEP TUSK II in Iraq, in the 2000s. whats the purpose of the sudden curve on the front of the turret? i would assume its for the driver’s hatch, but wouldnt this result in a shot trap? Basically, it is a small cut-out in the turret front to allow the opening of the driver hatch when the turret is straight. It would hardly create a shot-trap effect, especially due to the big inside angle of the part. I noticed quite a few errors in grammar and spelling on this page. I love your website and the information and images contained in your articles, however i believe it would help significantly in increasing the outward professionalism of your site. Thanks for pointing this out. Most of these mistakes on our older articles are due to the fact the original writer speaks English as a second language. The mistakes are systematically being amended. Hi. The article below is from The New York Times. I read it back then and have ever since wondered why the crew couldn’t get out. From the last paragraph I gather than the tank might have hit the bottom upside down. Looking tonight at articles about M1A1/2 tanks I understand that there are two or three hatches, and that the driver’s hatch is under the leading edge of the turret. I suppose if it was in deep enough mud perhaps even that hatch might have been un-openable. Any thoughts on why the crew couldn’t get out? The fog of war, or of fatigue? Or of a sandstorm? An M1A1 Abrams tank with a crew of four American marines veered off a bridge west of Nasiriya last week, crashing through a guardrail, sinking in the Euphrates River and killing the crew of four. A detachment of marines under the bridge witnessed the incident but didn’t realize what had happened. Investigators did not go looking for the tank until sometime the next day. The tank was part of a First Marine Division convoy heading north on Thursday night. Brig. Gen. John Kelly, assistant commander of the First Marine Division, confirmed the accident and said the matter was still under investigation. He said that the cause might have been that the driver fell asleep, but that it is also possible that the driver might have been momentarily blinded by blowing sand. Allied forces in Iraq last week experienced huge difficulties during a sandstorm, with visibility sometimes reduced to barely a few feet. But one of the marines who was under the bridge said it was dark but clear at the time of the accident. But he said he and his comrades assumed that a vehicle in the convoy had struck the edge of the 100-yard bridge without going over and that the splash was caused by falling concrete. The crew under the bridge bolstered its security for about an hour and then went back to standard night-watch levels, Sergeant Kerslake said. The sound of a convoy passing overhead is a deafening roar, he said. Had they seen the 60-ton Abrams tank hit the water, there is likely nothing they could have done to save the men, marines with Sergeant Kerslake’s unit said. The next day, other American marines found three sea bags, carrying personal effects, floating in the Euphrates downstream from the bridge. But the assumption by the marines guarding the bridge was that they had fallen off a moving vehicle. ”It was chaotic,” Sergeant Kerslake said. Communications were patchy for the crew under the bridge, which was part of the Second Marine Division, in part because its headquarters was in Nasiriya in the midst of a battle. ”Then a lieutenant colonel shows up” on Friday, announcing that he’s missing a tank, Sergeant Kerslake said. Later on Friday, Sergeant Kerslake said, divers entered the Euphrates and soon found the sunken tank. It was dragged from the river on Saturday. It took all day, with two tank recovery vehicles towing the Abrams ashore, righting it and leaving it several yards from the north bank. It remained there today, as if cast in mud, parked out of the way of the dozens of marines assigned to guard the bridge. The bodies of the crewmen were found and removed. And also on the above, if the tank landed upright in, let’s say, 20 feet of water, would the pressure of the water make it impossible to open the hatches? Thanks for the article. I have been around M1 Abrams for 14years. To throw in my opinion. They would not be able to open the hatches with the water pressure even if it landed upright. Those hatches are very heavy due to the significant amount of protection it provides to the crew. At 72tons + fully loaded, they would have been at the bottom before they even realized they were in a river. Tragic ordeal. Back at home we go ice fishing, when driving on a frozen lake its good practice to drive with your window rolled down an inch or more. In a situation where your vehicle breaks through the ice and you go under. Having the window cracked will equalize the pressure in the can and allow you to open the door. Otherwise plan B would be to bust the window out. Ways to improve this stupid tank: ONE; give it back the 105mm M68 gun: more ammo flexibility, as the 120mm M256 CAN’T USE HIGH EXPLOSIVE SHELLS AS RAYTHEON WON’T MANUFACTURE THEM DUE TO HOW CHEAP THEY ARE!!!!! ($200 a pop.) TWO; decrease its weight back to 62 tons; this makes the vehicle more manageable when a recovery is needed, as well as faster and more fuel-efficient. THREE; give it a 1,500 to 2,000-horsepower diesel engine, for better fuel economy. FOUR; DELETE THE URANIUM ARMOR!!!! Not only is the stuff radioactive, but it MELTS when it gets too hot!!! In other words this design was fine the way it was: the basic M1, not the M1A1 or M1A2. Should have just left it alone. Do you understand how backwards you sound. 2.The turbine engine is an amazing engine, it also is a very quiet engine even for a tank of that size. Depleted uranium is actually radioactive, it’s just less radioactive than natural or enriched uranium. The radioactive danger is still there, but it comes mainly from radon(naturally produced by uranium) and any traces of plutonium that may be there if the uranium hasn’t been properly processed. So I guess ventilating amunition depots and tanks that has been a long time in storage before entering it may be a good idea. Another thing: EVERYTHING melts if you heat it enough. I have no arguments against the lack of HE. 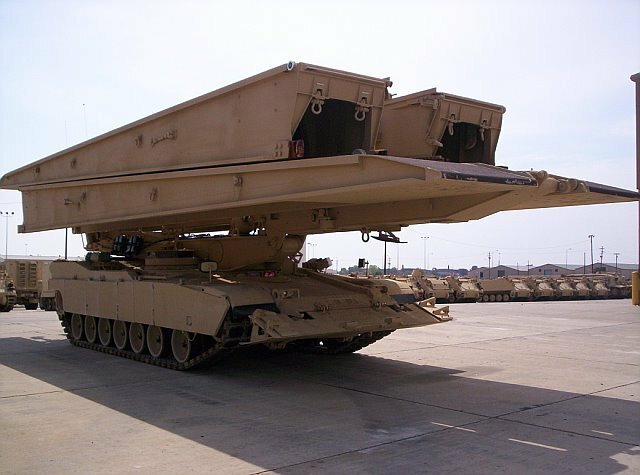 I was browsing on the M1 Abrams Wiki and saw an experimental variant called the M1 Thumper. I came here to see if you had further details on it, but you don’t seem to have mentioned it at least (unless I skipped over it). So I was wondering if you could possibly add in the M1 Thumper on this page? From what the wiki said it’s very similar to the CATTB with the main difference being the larger 140mm XM291 ATAC Gun it is equipped with. It was never fielded since it was cancelled at the end of the Cold War. The Thumper (as well as the CATTB) will be covered in its own article sooner rather than later. Have some patience please. Can you add the info about more recent versions (M1A2 SEP v2, SEP v3, SEP v4) and its respective illustrations, with the recently applied camo options, (NATO Tricolor woodland scheme, solid bronce green washable german paint) and the aspect of the SEP v3 prototypes? We would like to have separate articles about those versions in the future. I would like to see more info on the XM-1 ‘Yukon Jack’ that was tested at Fort Greely Alaska during the winter of 1980-81 .